Total private residential construction spending increased marginally to a seasonally adjusted annual rate of $334.6 billion in July 2013 according to Census estimates. Spending continues to improves, but remains well below the peak pace of $676.4 billion in March 2006. The current reading is 17.2% higher than a year ago. Single-family spending registered a slight increase of 0.5% for the month, while the home improvement category increased 0.8%. The multifamily category remained nearly unchanged with an increase of 0.1% for the month. In spite of the tepid month-over-month increases for July, on a 3-month moving average basis, all categories have experienced significant improvements over the course of 2013. Remodeling related spending is up 6.5% for the year-to-date. Single-family spending has increased by 11.6% and multifamily spending has increased 16.0%. 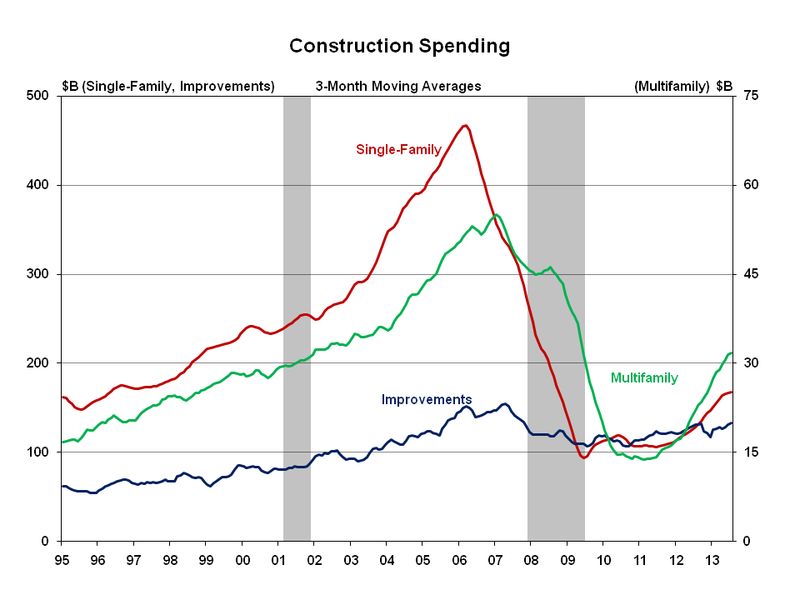 Since market low points, total private residential construction spending is up 46.4%, single-family 84.5%, multifamily 143.8%, and improvement-related spending 29%. The data shows improvements in construction categories for all categories but at a slower month-over-month rate than experienced in recently. The slow-down comes ahead of the effects of an increase in mortgage interest rates that has slowed both new home and pending home sales. This entry was posted on Tuesday, September 3rd, 2013 at 12:43 pm and is filed under Uncategorized. You can follow any responses to this entry through the RSS 2.0 feed. You can leave a response, or trackback from your own site. NIce information and the statics provided is almost up to mark. Like the way presented the information .